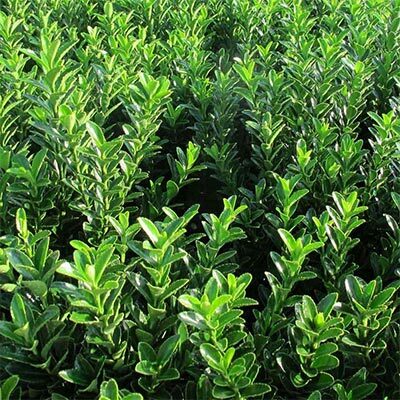 Buxus sempervirens (Box hedging, also known as ‘Boxwood’) is a native, shade tolerant plant that is suitable for most soil types and sites other than wet or windy sites. It is a versatile, classic hedge favoured by many people for its dense and verdant appearance. 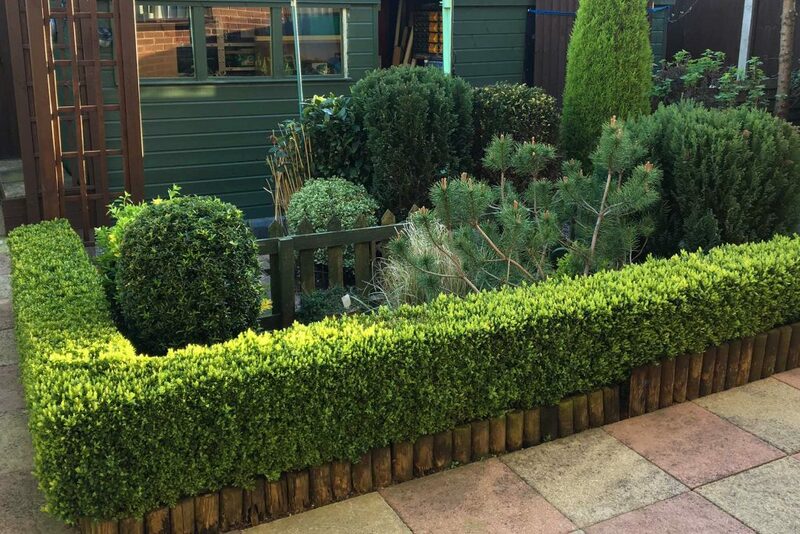 Due to its slow growth it is also very manageable in terms of upkeep and is easily trimmed and kept to a desired shape, often providing a lovely, green privacy screen if grown to height. 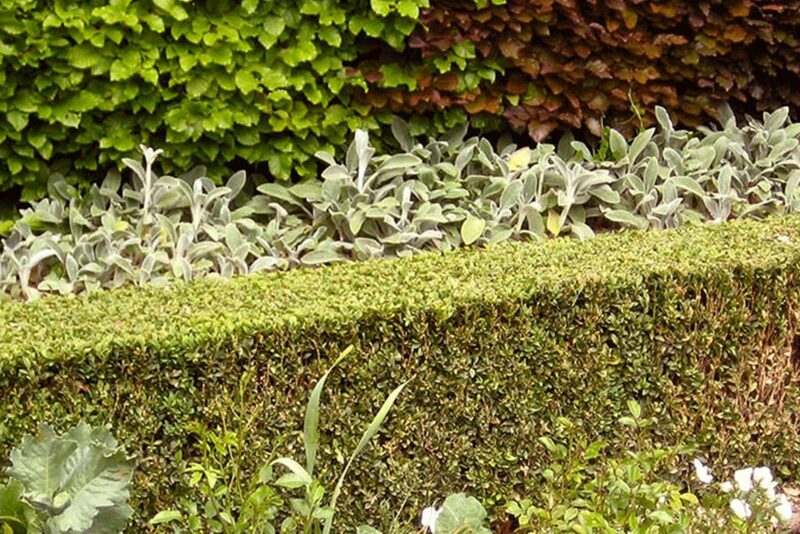 Because of its versatility and appearance, Box hedging has a universal appeal in both urban and large formal garden situations and can be used to great effect for borders, partitions, green walling (think mazes and pathways) and even beautiful and intricate parterre knotwork gardens. It truly is the most lovely of hedges with a multitude of possible combinations for shape, height and use which is why it is consistently one of our top ten selling species of hedge plant. Buxus Sempervirens comes in bare root, root ball, pot grown and instant box hedging. 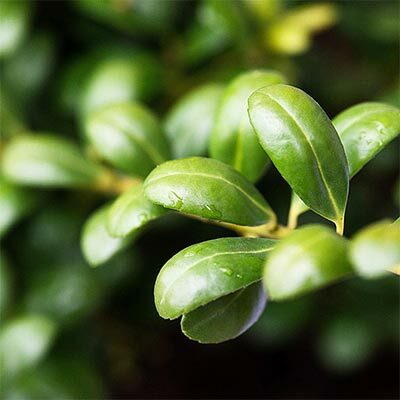 Buxus sempervirens has very dense small round dark evergreen leaves with an average growth rate of approx 10-15cm p.a. It should be trimmed in late spring with hand shears if possible, keeping the blade of the shears parallel to the hedge surface. 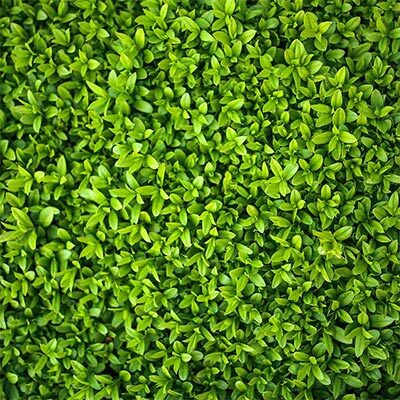 For an even more low growing hedge try Dwarf Box Hedging Plants (Buxus sempervirens Suffriticosa) or view our incredible selection of low growing hedging plants for more options. 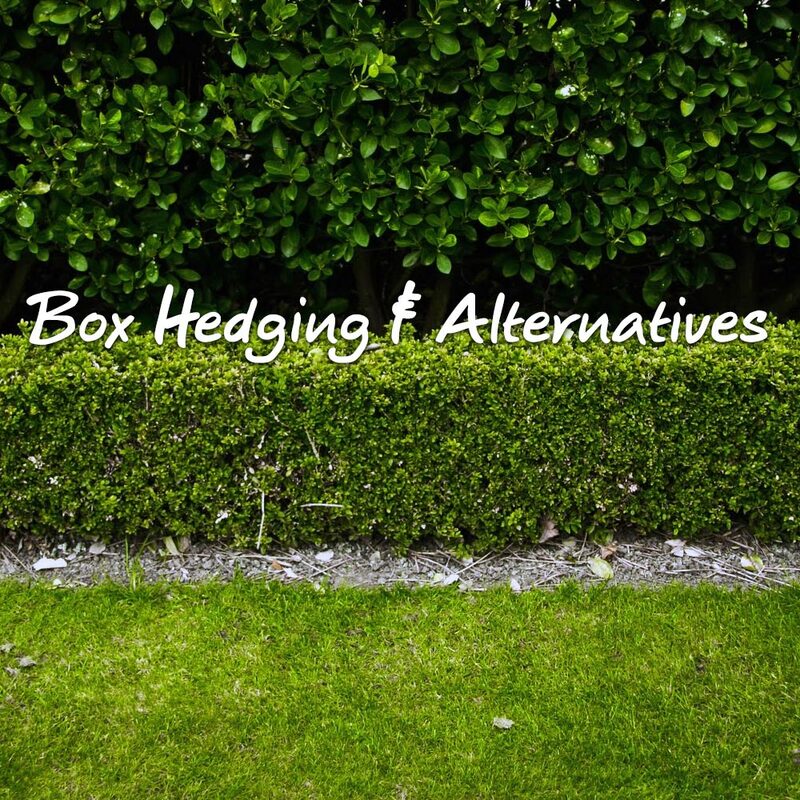 Box hedging is also the main form of hedge plant used for Topiary due to its specific characteristics and the shapes which can be created are only limited by the imagination. However there are timeless classics, always popular, such as Topiary Balls, Topiary Cubes and Topiary Spirals. 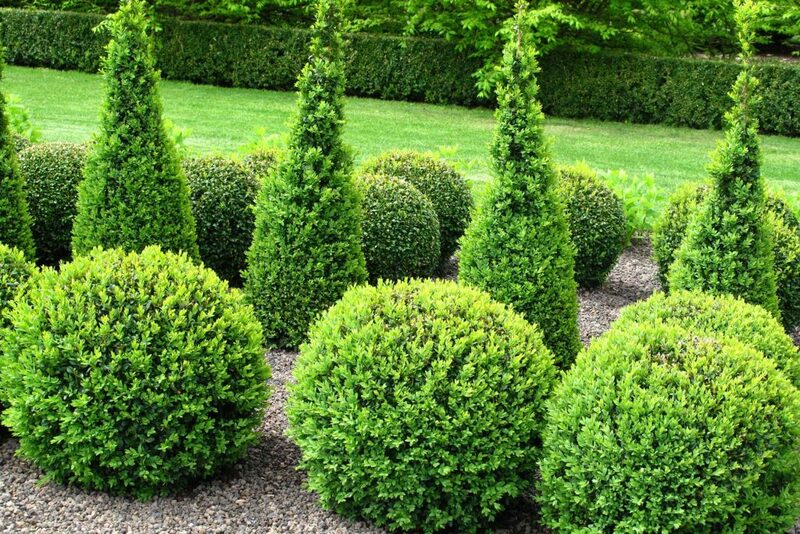 These are just some of the Topiary shapes available from Hedges Direct – for the full range click here. With various sizes of box hedging plants for sale we’re certain you’ll find exactly what you’re looking for in the root type, sizes and prices adjacent or alternatively view our huge range of evergreen hedge plants for year round interest. Make sure to regularly check your box for any sign of infection. Inspect plants for early symptoms as box blight spreads very rapidly in warm and humid conditions and is difficult to manage. Taking cuttings from healthy box in your garden will reduce the risk of introducing the disease. Box caterpillar was first found in 2007 and first sighted in the UK in 2008. It is in season from mid-March to October. 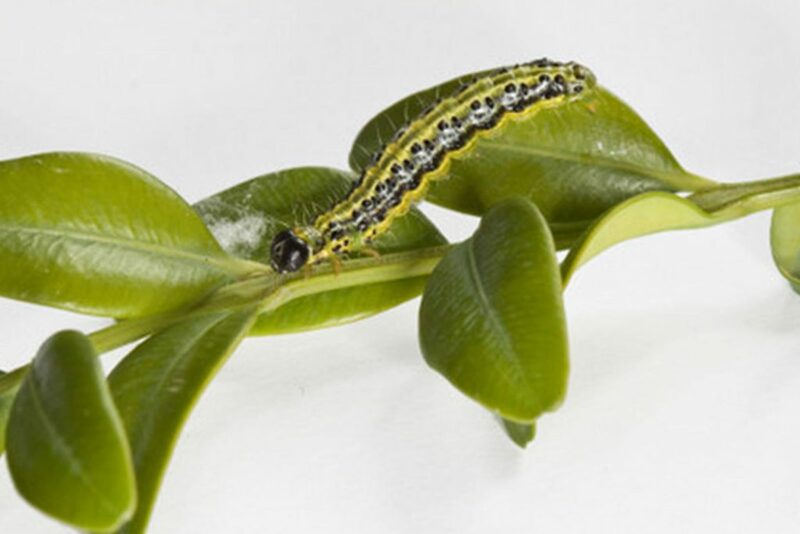 Box tree caterpillars feed within webbing and can completely defoliate box plants. The caterpillars are a lot more prominent in the south of the UK. See EBTS (European Boxwood and Topiary Society) for their map of caterpillar recordings. What to do and how to remove box tree caterpillars? Inspect your plants from mid-March to October. Inspect every few days to at least once a week for caterpillar damage such as eaten leaves, cob-webbing or frass balls. Spray your plants as soon as you see any damage or caterpillars (preferably with a safe biological insecticide or use nematodes). If you prefer not to use sprays, pick off the remaining caterpillars by hand and put them in water with a few drops of washing up liquid. Carefully comb through plants with a small hand claw/ rake to remove the cob-webbing and green balls of frass and clear away debris under the plants. Water the plants at their base, avoid wetting the leaves as this can cause the conditions that allow blight to take hold. Setup a pheromone trap to catch the male moths thus reducing the number of fertilised eggs that get laid by the females. We do not recommend using a jet wash to remove the caterpillars, this is likely to cause damage to the plants and promote blight. Is There An Alternative To Box? The obvious alternative to Box hedging is Ilex crenata or Japanese Holly – not a typical Ilex (Holly) at all but a lookalike for Buxus with small dark green leaves, an upright habit and slow growth which keeps it neat and tidy. But there’s also another alternative to Buxus – Euonymus Japonicus Jean Hugues which is a bit of a tongue twister and I’ve checked the spelling twice. It’s almost indistinguishable from Buxus to all but an expert and we think it’s going to become immensely popular in years to come – you read it here first. This photograph shows the Euonymus on the left and Buxus on the right or is it the other way round …. let me just double check that … yes, that’s right, Euonymus on the left and Buxus on the right – see what I mean about it being hard to tell the difference.